View of Table Bay with ships of the Dutch East India Company (VOC), c. 1683. Traders of the Dutch East India Company (VOC), under the command of Jan van Riebeeck, were the first people to establish a European colony in South Africa. The Cape settlement was built by them in 1652 as a re-supply point and way-station for Dutch East India Company vessels on their way back and forth between the Netherlands and Batavia (Jakarta) in the Dutch East Indies. The support station gradually became a settler community, the forebears of the Boers, an ethnic group in South Africa also known as the Afrikaners. At the time of first European settlement in the Cape, the southwest of Africa was inhabited by San people and Khoikhoi who were pastoral people with a population estimated between 13,000 and 15,000. 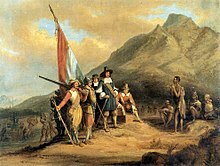 The Khoisan nomadic people were disgruntled by the disruption of their seasonal visit to the area for which purpose they gazed their cattle at the foot of Table Mountain only to find European settlers occupying and farming the land, leading to the 1st Khoi-Dutch War as part of a series of Khoikhoi-Dutch Wars. After the war, the natives ceded the land to the settlers in 1660. 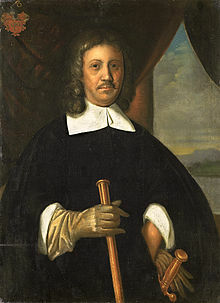 During a visit from the high ranking Commissioner Arnout van Overbeke in 1672, the Commissioner made a formal purchase of the Cape territory, although already ceded in 1660, his reason was to "prevent future disputes". The ability of the European settlers to produce food at the Cape initiated the decline of the nomadic lifestyle of the Khoisan since food were produced at a fixed location. Thus by 1672 the permanent Khoisan residents living at the Cape had grown substantially. The first school to be build in South Africa by the settlers were for the sake of the slaves who had been rescued from a Portuguese slaveship and arrived at the Cape with the Amersfoort in 1658. Later on, the school were also attended by the children of the Khoisan and the Free Burghers. The Dutch language as the main medium for commercial purpose were thought at school resulting in the Khoisan and even the French settlers finding themselves speaking Dutch more than their native languages. The principles of Christianity were also introduced at the school resulting in the baptisms of many slaves and Khoisan residents. Conflicts with the settlers and the effects of smallpox decimated their numbers in 1713 and 1755, until gradually the breakdown of their tribal society led them to work for the colonists, mostly as shepherds and herdsmen. The VOC favoured the idea of freemen at the Cape and many settlers requested to be discharged in order to become free burghers, as a result Jan van Riebeeck approved the notion on favorable conditions and earmarked two areas near the Liesbeek River for farming purposes in 1657. The two areas which were allocated to the freemen, for agricultural purposes, were named 'Groeneveld' and 'Dutch Garden'. These areas were separated by the Amstel River (Liesbeek River). Nine of the best applicants were selected to use the land for agricultural purposes. The freemen or free burghers as they were afterwards termed, thus became subjects, and were no longer servants, of the Company. After the first settlers spread out around the Company station, nomadic European livestock farmers, or Trekboeren, moved more widely afield, leaving the richer, but limited, farming lands of the coast for the drier interior tableland. There they contested still wider groups of Khoikhoi cattle herders for the best grazing lands. By 1700, the traditional Khoikhoi lifestyle of pastoralism had disappeared. The Cape society in this period was thus a diverse one. The emergence of Afrikaans, a new vernacular language of the colonials that is however intelligible with Dutch, shows that the Dutch East India Company immigrants themselves were also subject to acculturation processes. By the time of British rule after 1795, the sociopolitical foundations were firmly laid. In 1795, France occupied the Seven Provinces of the Netherlands, the mother country of the Dutch East India Company. This prompted Great Britain to occupy the territory in 1795 as a way to better control the seas in order to stop any potential French attempt to get to India. The British sent a fleet of nine warships which anchored at Simon's Town and, following the defeat of the Dutch militia at the Battle of Muizenberg, took control of the territory. The Dutch East India Company transferred its territories and claims to the Batavian Republic (the Revolutionary period Dutch state) in 1798, and ceased to exist in 1799. Improving relations between Britain and Napoleonic France, and its vassal state the Batavian Republic, led the British to hand the Cape Colony over to the Batavian Republic in 1803 (under the terms of the Treaty of Amiens). In 1806, the Cape, now nominally controlled by the Batavian Republic, was occupied again by the British after their victory in the Battle of Blaauwberg. The temporary peace between Britain and Napoleonic France had crumbled into open hostilities, whilst Napoleon had been strengthening his influence on the Batavian Republic (which he would subsequently abolish later the same year). The British, who set up a colony on 8 January 1806, hoped to keep Napoleon out of the Cape, and to control the Far East trade routes. In 1814 the Dutch government formally ceded sovereignty over the Cape to the British, under the terms of the Convention of London. Administrative divisions of the Cape Colony on the eve of the 1795 British occupation. The title of the founder of the Cape Colony, Jan van Riebeeck, was installed as "Commander of the Cape", a position he held from 1652 to 1662. During the tenure of Simon van der Stel, the colony was elevated to the rank of a governorate, hence he was promoted to the position of "Governor of the Cape". ^ Robert Montgomery Martin (1836). The British Colonial Library: In 12 volumes. Mortimer. p. 112. ^ a b "Kaap de Goede Hoop". De VOC site. Retrieved 8 February 2013. ^ J. A. Heese, Den Herkoms van de Afrikaner 1657 - 1867. A. A. Balkema, Kaapstad, 1971. CD Colin Pretorius 2013. ISBN 978-1-920429-13-3. Bladsy 15. ^ a b Newmark, S. Daniel. The South African Frontier: Economic Influences 1652-1836. Stanford University Press. pp. 10–11. ISBN 978-0-8047-1617-8. ^ Sir John Barrow (1806). Travels Into the Interior of Southern Africa. T. Cadell and W. Davies. p. 25. Wikimedia Commons has media related to Cape Colony. The Migrant Farmer in the History of the Cape Colony. P.J. Van Der Merwe, Roger B. Beck. Ohio University Press. 1 January 1995. 333 pages. ISBN 0-8214-1090-3. History of the Boers in South Africa; Or, the Wanderings and Wars of the Emigrant Farmers from Their Leaving the Cape Colony to the Acknowledgment of Their Independence by Great Britain. George McCall Theal. Greenwood Press. 28 February 1970. 392 pages. ISBN 0-8371-1661-9. Status and Respectability in the Cape Colony, 1750–1870 : A Tragedy of Manners. Robert Ross, David Anderson. Cambridge University Press. 1 July 1999. 220 pages. ISBN 0-521-62122-4.